Within the idyllic beach and ocean visible out of every window, the peaceful location this family-friendly two-bedroom villa provides the ideal relaxing retreat. With its picturesque terrace. Within the idyllic beach and ocean visible out of every window, the peaceful location this family-friendly two-bedroom villa provides the ideal relaxing retreat. With its picturesque terrace, fantastic sea views and well-equipped interiors, there's little reason to leave – but you should, since charming towns, ancient rock tombs, lively local markets and fantastic walking routes surround the area. This beautiful holiday villa is located in a small seaside neighbourhood, just a 15-minute drive from the popular city of Bodrum. Over two floors, the stylish property sleeps four guests, with two bedrooms and two bathrooms. 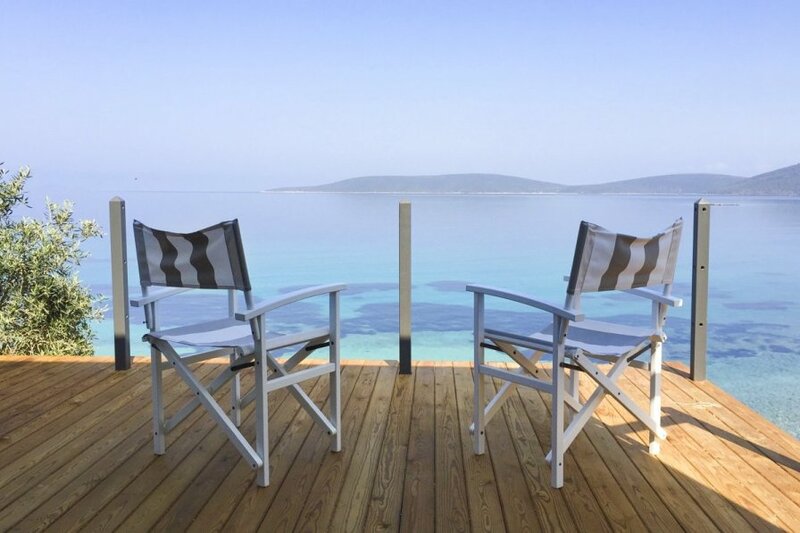 Villa Merina is located in the charming seaside area of Gokceler Guvercinlik. This remote neighbourhood boasts just six other houses, perfect for those who want to escape the hustle and bustle of the busier tourist towns. Situated right on the beach front, guests can stroll straight out onto the sea shores from the villa itself. The villa is located just 15 minutes from Bodrum airport and 10 minutes from Bodrum main town. The vibrant city boasts everything from a beautiful marina to ancient sites and boutique shops, so it's well worth a visit. For a traditional shopping experience, you can visit Bodrum's farmer markets. There you'll find stalls selling everything from hand-made rugs and clothing to fresh produce. For a dose of history and culture, the most prominent ancient site in Bodrum is the castle of St. Peter, dating back to the Knights of St. John. For fantastic views of the city (cameras at the ready), head to the ancient Hellenistic theatre, built into the hillside.